Virtual New Zealand Stamps: 1994 Wild Animals. 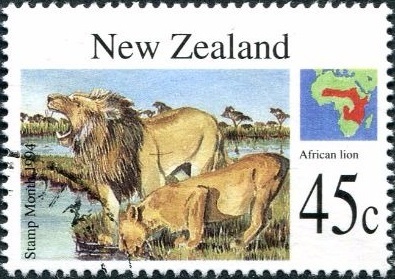 The ten animals were carefully selected as being ones that children would recognise most readily. Most of them can also be found in zoos in New Zealand. Each stamp also presents a mini-lesson in geography, with a small map showing where each animal comes from. The Polar bear, Siberian tiger and Giant panda are found in three of the most forbidding regions on earth. Each has evolved to cope with harsh climatic extremes. 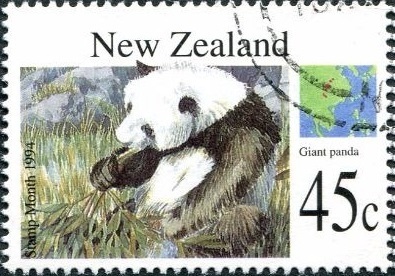 The mountains of central and western China are the panda's only known habitat. Also rare is the magnificent Siberian tiger, the largest member of the cat family. Africa means wild animals to many - the animals chosen from the jungles and open, grassy plains were the giraffe, African lion and African elephant along with the Plains zebra, the White rhinoceros and the hippopotamus. 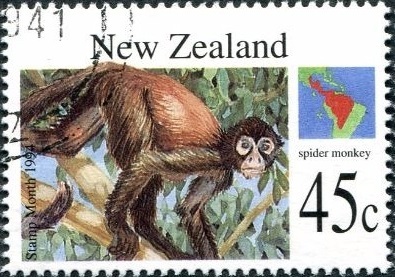 The spider monkey is found in the forests between Mexico and the southern part of the Amazon basin. 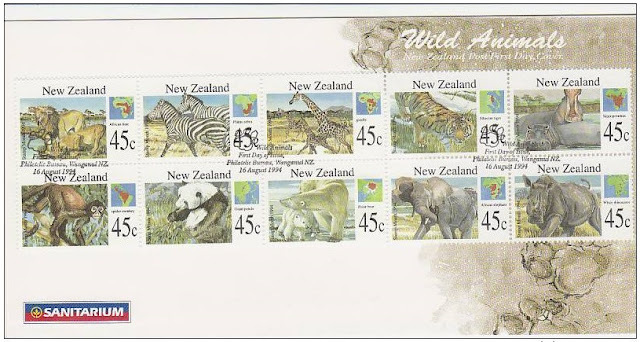 We had trouble finding good single mint stamps without cutting them out of a full strip so we have decided to feature something a bit different for this blog. 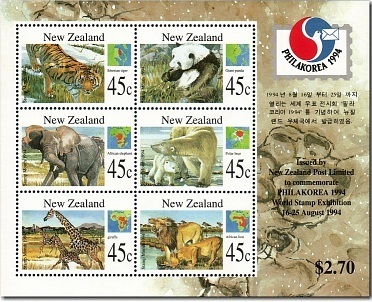 Below the stamps are used, two examples of each with all the stamps on the right-hand side being from the first day of issue. 45c - Giraffe / Africa (used). 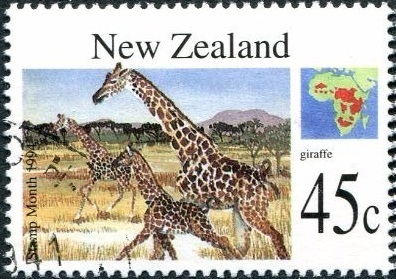 45c - Giraffe / Africa (FDC used). 45c - Siberian Tiger / Siberia (used). 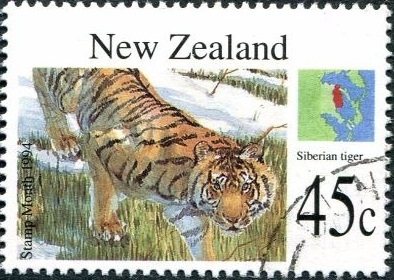 45c - Siberian Tiger / Siberia (FDC used). 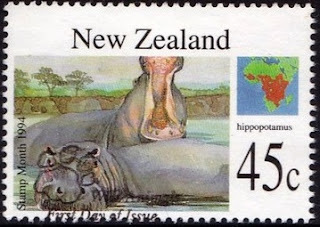 45c - Hippopotamus / Africa (used). 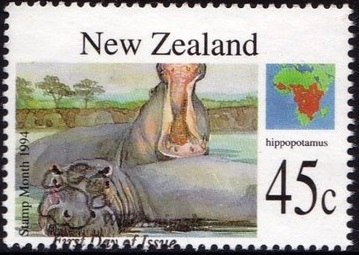 45c - Hippopotamus / Africa (FDC used). 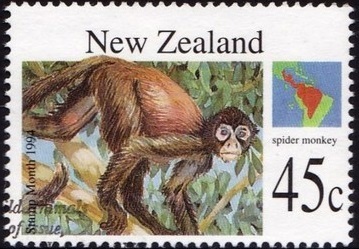 45c - Spider Monkey / Central America (used). 45c - Spider Monkey / Central America (FDC used). 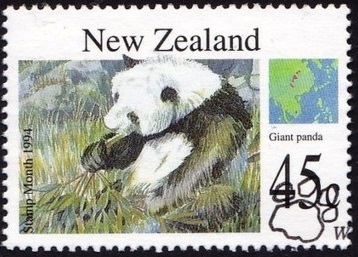 45c - Giant Panda Bear / Central and Western China (used). 45c - Giant Panda Bear / Central and Western China (FDC used). 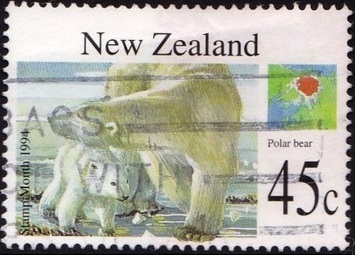 45c - Polar Bear / Arctic (used). 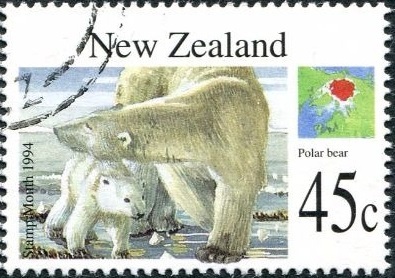 45c - Polar Bear / Arctic (FDC used). 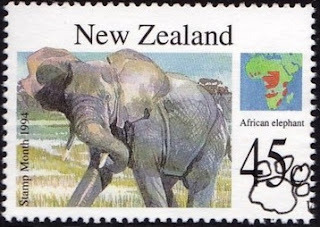 45c - African Elephant / Africa (used). 45c - African Elephant / Africa (FDC used). 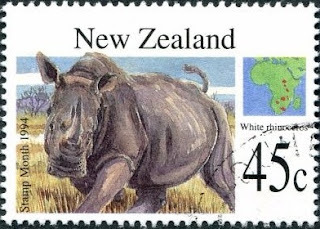 45c - White Rhinoceros / Africa (used). 45c - White Rhinoceros / Africa (FDC used). 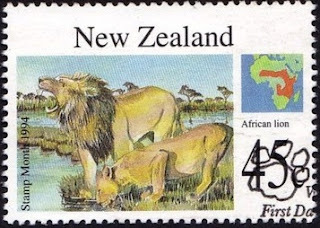 45c - African Lion / Africa (used). 45c - African Lion / Africa (FDC used). 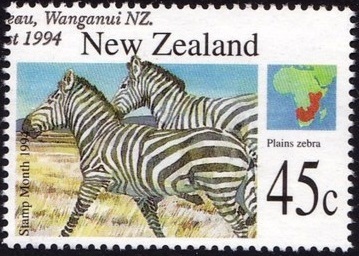 45c - Plains Zebra / Africa (used). 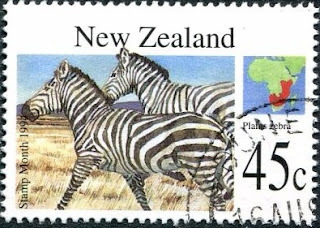 45c - Plains Zebra / Africa (FDC used). 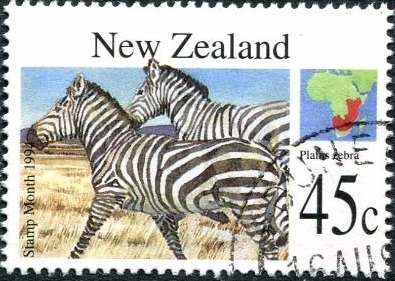 Full Strips of 10 Stamps. The stamps were produced in strips of ten with ten such strips (rows) to a full sheet of stamps. Each row of stamps on each sheet had the stamps in a different order, so no one stamp design appeared twice in the same position on any row of stamps. Notice this in the two strips below which are both in a different order to the strip above and in our header. 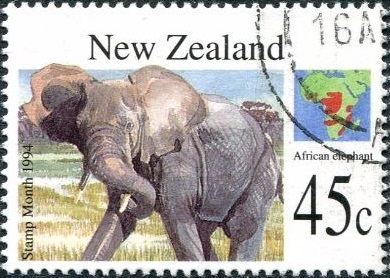 First Day Cover - 16 August 1994. Date of issue: 20 July 1994. Designer: Denise Durkin, Wellington, NZ. Stamp size: 40mm x 28mm; Miniature Sheet 125mm x 100mm. 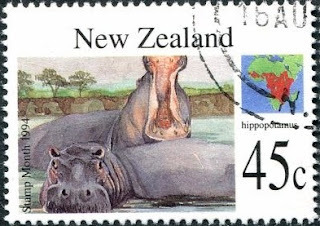 Sheet size: 100 stamps per sheet; Miniature Sheet of six stamps. Paper type: Coated Papers, red phosphor coated, unwatermarked. Period of sale: Theses stamps remained on sale until 20 July 1995. 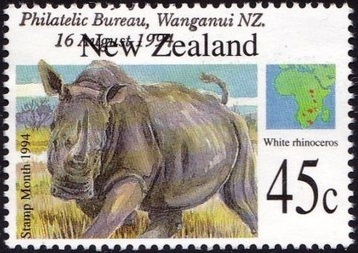 Some of the images in this post were used with permission from the illustrated catalogue of StampsNZ.